Judy Ann Santos goes twinning with her youngest daughter Luna in a Wonder Woman-inspired costume. Then the little one transforms into Princess Jasmine, while Kuya Lucho wears a scary mask. Halloween has become a fun time especially for those who can't wait to dress up in a costume. 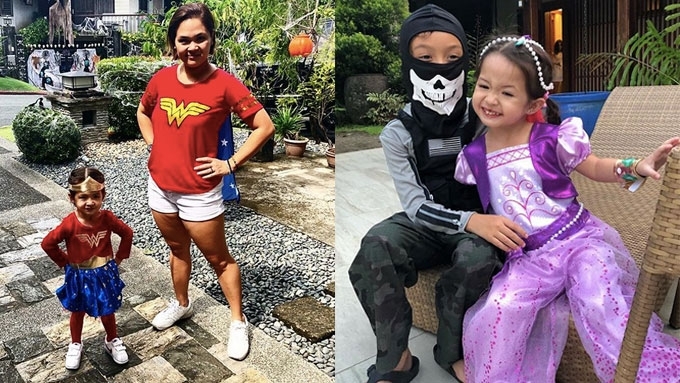 For this year, our favorite celebrity kids are just as game to look either spooky or stylish or super cute version of a movie character. Early this month, Marian Rivera became extra creative and resourceful with her costume idea for Zia. The famous mom-daughter tandem nailed it! Zia won "Best in Costume" for her Intergalactic Princess costume made of recycled materials. This Instagram darling transformed into Charlie Chaplin, a worldwide icon. Then she went twinning with her mom Dra. Vicki Belo as a butterfly. Kuya Primo was a smiling Angry Bird. Luna went twinning with Mommy Judy Ann Santos as Wonder Woman. Then after a few minutes, Juday posted another photo, which she captioned, "May change costume si madam!" Baltie's mom Isabelle Daza loves to dress up every Halloween. For this year's festivities, Baltie's first costume was Erwan Heussaff. Before welcoming her baby sister Carmen, Lucia went trick or treating with her parents Bianca Gonzalez and JC Intal. They went as the characters of the popular British children's show, Ben and Holly's Little Kingdom. Isabella and her mom Mariel Rodriguez were golden angels. Feather wore two costumes. Her first was as Strawberry Shortcake. Later on, she became Princess Anna. 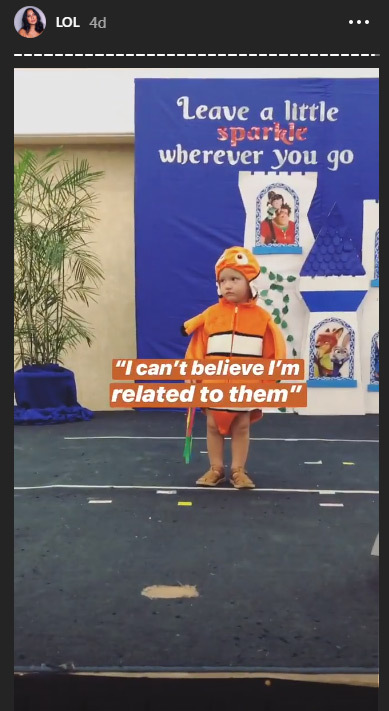 There were two celebrity kids who wore the Nemo onesie. There's Olivia Reyes, who is now vacationing in Japan. In one of the Halloween parties around the neighborhood, Archie Burnand also joined in the fun. Hunter suited up for his first Halloween. Leave it to Mommy Divine Lee to go all-out on her son's first family Halloween. Baz also became a slightly grumpy baby dinosaur. Adorable Malia was all smiles in her butterfly onesie. Melissa Ricks' toddler was all glammed up a la Audrey Hepburn's famous character. Arabella Simone as Boo from Monsters, Inc.
Geoff Eigenmann's little girl easily became Boo in an oversized pink -shirt and two high ponytails. It was Ellie's request to be a black cat this Halloween. Andi sewed the costume herself! Amelia and her parents Bangs and Lloydie were a giraffe family for Halloween! Liz Uy's one-year-old boy was super cute in his Dragonball costume! Pancho went trick-or-treating with his parents Jim and Saab Magalona-Bacarro as Todd Chavez from the Netflix animated series BoJack Horseman. Later on, he changed into an adorable Winnie the Pooh onesie—or as his mom captioned, "Winnie the pooper." The whole family were game for Halloween!